The trade union movement has always been at the vanguard of political change in Britain. And furthering economic equality goes hand in hand with political institutions that deepen political equality. To ignore the role of the political system (which concentrates political power in a minority of voters in a minority of seats) in driving political inequality, is to miss the potential for radical political change. To truly shift power closer to the people on a long-term basis requires more than changing the underlying economic structures. Embedding changes in the political system would allow for a change in the very way we do politics, securing better social and political outcomes. 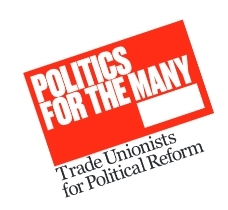 Politics for the Many: The Trade Union Case for Political Reform sets out the opportunities for the labour movement as a whole in uniting behind a broad platform of progressive political reform. 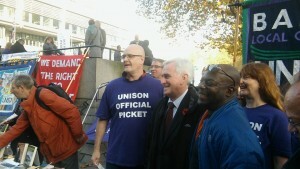 The Westminster model of government has allowed for sweeping legislation, eroding trade union rights in the UK. Barnet TUC and the Barnet Alliance for Public Services participated in the annual general meeting of the Peoples Assembly Against Austerity on Saturday, just two of many delegations to the largest anti-cuts conference of the year. 2015 has not been an easy year, but it has been one in which the need for and effectiveness of the Peoples Assembly has been thoroughly proved. Before the motions and the debates, there were introductory speeches. The first up was Dave Ward, new General Secretary of the CWU postal and communications union. He began by urging delegates to view the massive Tory U-turn on tax credit cuts as a big win for our movement, but also cautioned that there are four and half years left of the Tory government which in his own words had created a situation “the rich have never found an easier race to the top, the rest have never had a harder race to the bottom”. Ward also condemned the decision for Britain to join the Western bombing of Syria, which he likened to a head down charge. He described his ideas for what to do as both redesigning the fundamentals of the trade union movement for the modern economy, and also supporting the revitalised Labour Party under its new leadership. His vision for a new way to do things in the labour movement is to get sectoral, rather than localised, organisation and negotiation, mobilising as much of the trade unions’ six million members as possible. The next speaker was Yannis Gourtsoyannis, a junior doctor and member of the British Medical Association junior doctors’ committee, with a report on the historically unprecedented industrial struggle they have been engaged in. The government has partially backed off imposing new employment conditions on junior doctors, causing the BMA to call off the planned, and potentially massive, strike on December 1st, but Dr Gourtsoyannis said that the proposals would still expand hours and pay differentiation among them under the guise of providing “cost neutral” expanded 7-day services (it strongly reminded me of the attempt to get London Underground workers to provide Night Tube services without costing any extra money). The young doctor emphasised that what at stake was not just the conditions of the staff and the safety of service users, but that if the doctors win they will have forced a crack in the edifice of austerity ideology. The struggle continues. The third speaker was Christine Blower, leader of the National Union of Teachers. She focused her speech on the NUT’s firm belief in the power of social movement trades unionism, and said that the spirit of linking labour organisation to a wider political movement was had enabled successes such as the excellent June 20th demonstration this Summer. Blower gave the meeting some examples of the hardships that her teacher members were seeing amongst children in Cameron’s Britain: encountering children who only eat their free school meals because they are not fed at home, and entire cohorts of children at school that disappear as their parents take them away fleeing sky-high urban rents. Following the opening speakers, a range of policy motions were debated and agreed upon (see the People’s Assembly website for these). BTUC and BAPS jointly moved a motion motion urging all member bodies to actively campaign to make all their local authorities into TTIP-free zones. The AGM unanimously agreed to get its local groups to raise petitions and bring motions to local and regional legislative bodies to get them to defy this secretive and menacing deal. This strategy is a real opportunity to redress the fact that TTIP has been largely ignored in the British media, and to raise awareness of TTIP among the public. This has already been done extensively in France, Germany and Spain, as well as 19 British authorities including Conservative run North Somerset. The main part of the day closed with a key-note speech by socialist Shadow Chancellor, John McDonnell, who received a rapturous welcome. McDonnell admitted that the mere eight weeks that have passed since Jeremy Corbyn became Labour leader have been a challenge, but that brave stands by the party are being vindicated. He praised the People’s Assembly as essential part of the new politics that Jeremy promised to deliver, and said that these new politics is delivering. Although Parliament did vote for war a majority of Labour MPs and Shadow Cabinet members did vote “No” on a free vote, something McDonnell said he wished the Tories had allowed (only 7 Tory MPs defied the whipped vote on Wednesday). This lead us well into the final session, which had been added to the agenda in response to the bombing of Syria. The People’s Assembly affirmed opposition to war, and to help to build the Stop the War Coalition march on the following Saturday (12th of December) and the Campaign for Nuclear Disarmament demonstration on February 27th 2016. 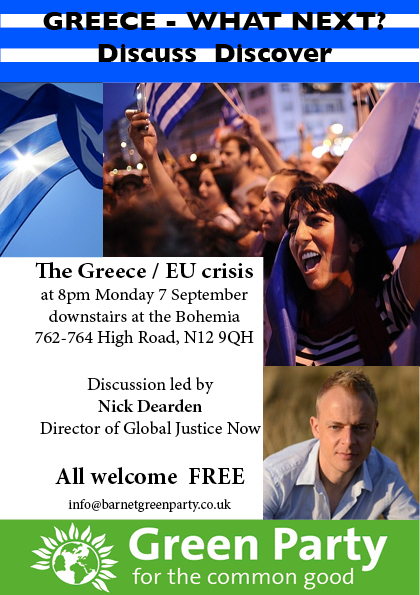 On Monday 7 September at 8pm downstairs at the Bohemia Nick Dearden, Director of Global Justice Now and a leading member of the Greece solidarity campaign, will discuss the Greece crisis, its implications and what to do. 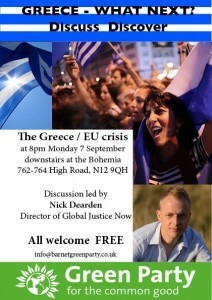 These events are public – all are welcome. So far neither the political range of candidates for the Labour leadership nor the ideas they have voiced have set the world of progressive politics alight. So if we want to use the selection of a new leader to excite people about the potential of socialist politics, then it’s up to us to get this debate going. I am launching this website to host a debate on the issues the Labour leadership candidates have to address and to promote some of the ideas and policies people think any new leader should adopt. We start with a hard hitting analysis of Labour’s electoral geography in last week’ selection by Andrew Fisher, the Director of the Left Economic Advisory Panel. If you would like to submit a paper on your ideas about what the Labour leadership candidates need to address, send us your ideas by emailing me on radical-labour@hotmail.com. At the moment the choice of a new Labour leader is looking like a glamour contest between a group of candidates with little ideologically to choose between them. Let’s transform this leadership election into a real debate about the future of socialism, our party and our country.